We recently tried these and liked them both very much. 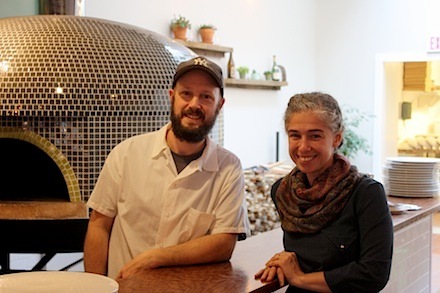 Though Nicoletta bills its pizzas as Midwestern-style and Oak as Neapolitan, their styles are pretty much the same, not thin-crust but not thick either, with a puffy edge surrounding a pleasingly thin center. Pizzas at Nicoletta are quite large, easily shareable by 2 to 4 people, depending on how many other dishes you order. Stanley and I had fried artichokes and fried calamari for appetizers (very large portions). The artichokes were right up there with our favorites, Socarrat Paella Bar and Rafele, and the calamari lightly fried and delicious. The pizza was too big for us to finish. I had the remaining 2 slices for lunch the next day. We also had a growler (37 ounces) of beer, from their excellent selection. Oak features a large selection of small plates, which can be ordered individually or as 3 for $21 or 5 for $35. Four of us shared double orders of octopus salad (spectacular) and prosciutto and a single order of blue cheese from Old Chatham Sheepherding served with toasts. Then we shared 2 pizzas, which are plate-size and enough for 2 to share if you have appetizers. There is a great beer selection as well as wines by glass or bottle. So, we now have 2 new favorites for pizza and small plates, whether we are in the city or the country.